What&apos;s making Utah&apos;s moose numbers rise and fall? Study will track populations of animals with radio collars in Uintas and Wasatch Front. Al Hartmann | Tribune file photo A captured moose is carefully unwrapped by Utah and Colorado Division of Wildlife personnel afte Al Hartmann | Tribune file photo A bull moose lazes in sage and aspen trees on the way up the Old Juniper Trail in Logan Canyon in Steve Griffin | Tribune file photo Snow falls on a moose as it snacks on some bushes near Brighton Ski Resort in 2011. 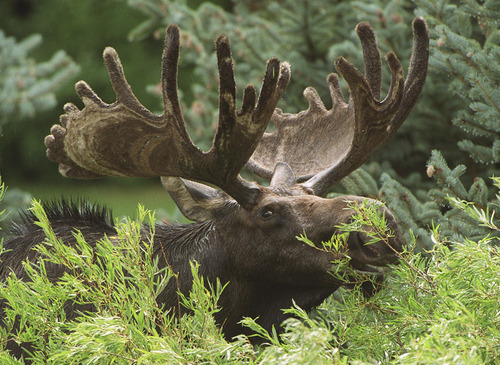 Steve Griffin | Tribune file photo A bull moose munches on some fairway shrubbery at Jeremy Ranch. Steve Griffin | Tribune file photo A cow moose makes her way through a parking lot on Foothill Boulevard. It was later tranquilize Steve Griffin | Tribune file photo A cow moose, left, and her twin yearling calves walk along the road in Big Cottonwood Canyon in Steve Griffin | Tribune file photo As her twin calves keep a close watch, a cow moose eats water plants pulled from the bottom of Al Hartmann | Tribune file photo Members of the Utah and Colorado Division of Wildlife Rescources carefully move a captured moose Al Hartmann | Tribune file hoto Wildlife personnel peer into a horse trailer to check on the state of a 3-year-old female moose af Steve Griffin | Tribune file photo Snow falls on a moose as it snacks on some bushes near Brighton Ski Resort in 2011. 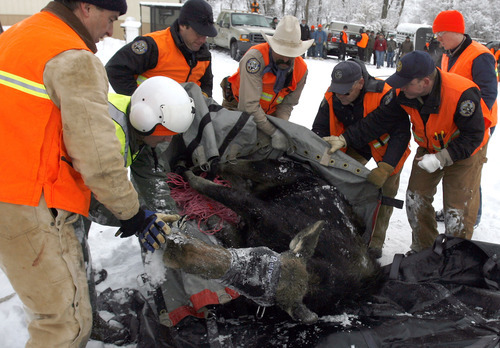 Al Hartmann | Tribune file photo A captured moose is carefully unwrapped by Utah and Colorado Division of Wildlife personnel after being transported via helicopter to a staging area near Huntsville. 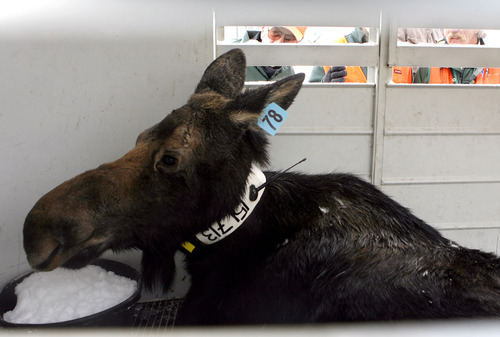 There the moose were given radio collars, ear tags, and had blood drawn before being placed in trailers to be driven to Colorado as part of an animal exchange program. Al Hartmann | Tribune file photo A bull moose lazes in sage and aspen trees on the way up the Old Juniper Trail in Logan Canyon in 2006. 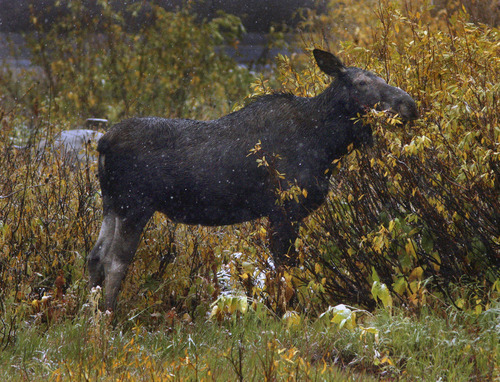 Steve Griffin | Tribune file photo Snow falls on a moose as it snacks on some bushes near Brighton Ski Resort in 2011. Steve Griffin | Tribune file photo A bull moose munches on some fairway shrubbery at Jeremy Ranch. 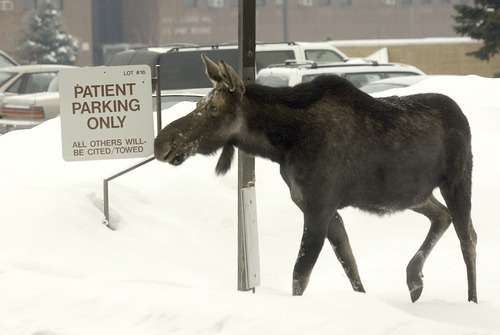 Steve Griffin | Tribune file photo A cow moose makes her way through a parking lot on Foothill Boulevard. It was later tranquilized by the Division of Wildlife Resources and relocated to a more remote area. Steve Griffin | Tribune file photo A cow moose, left, and her twin yearling calves walk along the road in Big Cottonwood Canyon in 2006. 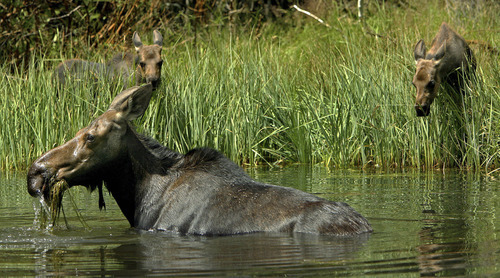 Steve Griffin | Tribune file photo As her twin calves keep a close watch, a cow moose eats water plants pulled from the bottom of the fishing pond near the entrance to Snowbird in 2006. 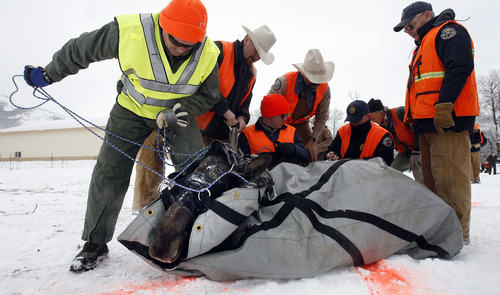 Al Hartmann | Tribune file photo Members of the Utah and Colorado Division of Wildlife Rescources carefully move a captured moose from its helicopter flight bag onto a carrying tarp in preparation for tranporting it to Colorado as part of an animal exchange program. Al Hartmann | Tribune file hoto Wildlife personnel peer into a horse trailer to check on the state of a 3-year-old female moose after being captured, flown by helicopter, radio collared, tagged and given an antibiotic in preparation for transporting her to Colorado as part of an animal exchange program. 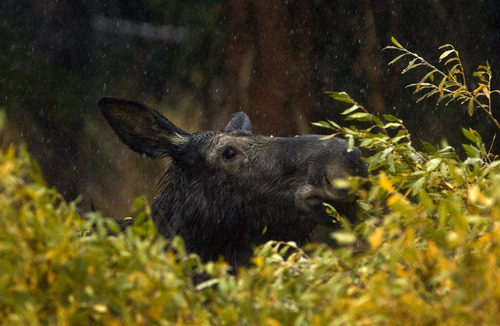 Steve Griffin | Tribune file photo Snow falls on a moose as it snacks on some bushes near Brighton Ski Resort in 2011. Few forms of wildlife in Utah are more popular than the gangly legged, long-nosed mammal called a moose. Many memories of family camping, fishing or hiking trips are secured with stories of seeing a bull moose with large antlers or a cow moose flanked by twin calves. Those are moments not likely experienced by pioneers as moose were not officially recorded in the Beehive State until the early 1900s. It does, how­ever, seem that Utah&apos;s moose population, currently in a slight decline but apparently climbing upward, is on stable ground. The same cannot be said for moose in a land known for the huge ungulates. A little closer to home, Wyoming is also dealing with a decline in moose and is wondering if a parasite is responsible for much of the drop. Reports show a 70 percent decline in the number of moose around Jackson and Grand Teton National Park. Predators like grizzly bears are also sharing in the blame. "Predation is not a big deal in Utah, but we are the southern extreme of moose range, and those things impacting other populations can be attributed to possible declines," said Anis Aoude, mammals coordinator for the Utah Division of Wildlife Resources (DWR). Aoude says Utah&apos;s moose population has experienced a decline in recent years but appears to be rebounding. "It isn&apos;t anything [like] what some of the other states have experienced. We probably experienced our highest numbers in Utah at around 4,000, and right now we are probably around 3,000," Aoude said. "We have seen a pattern like this before." However, there has not been much of a chance to track moose populations in Utah. They are, after all, relatively new inhabitants and were in fact quite likely beaten to the state by pioneers. The first recorded sighting of a moose in Utah came at the mouth of Spanish Fork Canyon in 1906 or 1907. Biologists believe the Shiras moose (one of four subspecies) immigrated to Utah naturally from Idaho and Wyoming. Shiras are the smallest of the subspecies and may be able to better regulate body temperature than their larger counterparts. That could be an advantage with climate-change issues apparently wreaking havoc on the Minnesota moose. State wildlife officials didn&apos;t determine an established moose herd existed in Utah until 1947, and formal management of the species did not happen until 1957. The first regulated hunt for moose in Utah took place the following year in 1958. There have been several research projects on moose in the state with the majority of attention being paid to an area known as the North Slope of the Uinta Mountains and determining the carrying capacity of the big animals. Another research project focused on a possible decline in large-antlered bulls on the North Slope. The North Slope will again be studied when a planned research project involving Utah State University and the DWR gets under way early next year. The idea is to compare populations that have been established for a while like the North Slope&apos;s to a relatively new population like the Wasatch unit. That means people hiking the Cottonwood Canyons, fishing at Strawberry Reservoir or residents in Park City might be seeing cow moose with radio collars in the coming years. "We feel the dynamics of the moose in those two populations are quite different," said Dan MacNulty, an assistant professor of wildlife ecology at Utah State University and part of the team that will conduct the moose research. "As a working hypothesis we feel the North Slope population reached and surpassed its carrying capacity. It came crashing down, but now fluctuates up and down. The Wasatch, as far as our data is concerned, is only 14 years old." MacNulty expects that the Wasatch population has only completed the upward phase of the pattern and is now "on the peak of that trajectory," is currently exceeding the capacity of the land to serve the entire population and will now begin to drop. The project, which could lead to 120 cow moose (60 in each study area) being outfitted with high-frequency VHF radio collars over four years, will also give biologists a chance to look at other important factors impacting the species in Utah. Biologists will track reproduction rates of cow moose in the study areas and document survival rates of the animals. The research team will also determine what caused death in the moose lost during the study. Findings from the research will be used by Aoude and other state biologists to help determine hunting permit numbers in the coming years. Aiding in the management is information gathered from samples provided by hunters over the past four years and analyzed by Leslie McFarlane, wildlife disease coordinator for the DWR. She said preliminary numbers show that 66 percent of 64 moose tested had the arterial parasite elaeophora schneideri, the arterial parasite Wyoming officials feel may have played a part in the decline of moose in their state. McFarlane said samples collected from this year&apos;s hunt have not been incorporated into the numbers. Nutritional testing on the same samples has shown some deficiencies and excessive levels in some cases. Nutrition can impact reproduction, immune system function and growth, according to McFarlane. "We just don&apos;t have a lot of information about moose," Aoude said. "This research will help us identify possible issues that may be impacting our populations now or in the future." Moose are the largest member of the deer family, and there are four subspecies. Shiras are the smallest of the four and the subspecies found in Utah. Historical records indicate there were no known moose in Utah before the early 1900s and that they naturally moved here from Idaho and Wyoming. The first recorded sighting of a moose in Utah was in 1906 or 1907 at the head of Spanish Fork Canyon. 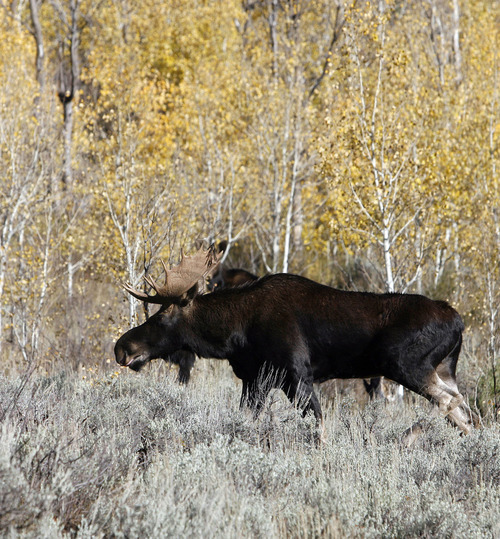 Moose hunting is allowed in Utah under a "once in a lifetime" drawing. There were 176 bull moose and eight antlerless moose taken by hunters in 2011. Since 1973, 345 moose have transplanted from a location in Utah to another and 115 have been relocated to Colorado.